I will admit it… I am a coffee addict. I love all kinds of coffee – from a traditional medium roast to a foamy cappuccino. I am totally a sucker for a great cup of coffee, especially when it’s cold outside! 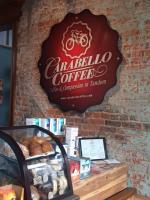 That said, I recently had the pleasure of visiting Carabello Coffee. This was my first trip to this shop, and I was greeted with warmth from the moment I walked in. The smells, the people, the ambiance – it was just what I needed on a very cold morning. I ordered the Jubilation blend and took a seat for a meeting with a colleague. Looking around I saw people working on their laptops, other meetings in progress, and moms fueling up for the day with toddlers in tow. A great way to start any morning! I am always on the lookout for little gems like this place, and fortunately Northern Kentucky is full of great coffee shops. If you are a fan of a great cup of joe, click here to find your next refueling station!